It’s certainly not getting easier to sit around the table with your family and enjoy a wholesome dinner. If you’re a working mom, you probably drive straight from work to pick your kids up from practice or another after-school activity. Grabbing a few burgers on the way home or eating sandwiches in front of the TV can be an inviting option when you’ve such had a long day. It can be hard to make kids sit still for 30 minutes to share a little time around the dinner table. However, there are many benefits of eating together as family. Even if you can’t sit down together as a family every night, consider making a sit down dinner with family a 4 or 5 times a week tradition. You’ll be glad you made the effort of eating together as family as it will have many positive effects on your family. In fact, The Washington Post published an article that expresses it very well and I agree, “The most important thing you can do with your kids? Eat dinner with them.” And I’d go a step further and say it is good for you and your spouse too. Spending quality family time together on a regular basis is important to the health of the family dynamic and speaks a lot to your commitment to each other. Sitting down to eat is a form of thoughtful meditation and it makes a great daily mindfulness exercise. It’s a time to relax and reflect on the day, in a conscious manner. Try it sometime! Eating while standing in front of the fridge or while watching TV just isn’t the same. Sitting around a table lets everyone in your family have a little chill out time from work, from homework, from cell phones and other technology. It’s a type of relaxation that we don’t get enough of these days. If you need help with letting go of stress and enjoying family mealtime, see this article for tips. For kids, stability is created by events they can anticipate, that happen again and again. Making eating together as family a usual occurrence in your household is one easy way to provide this stability, and to give your kids a sense of control in their lives. When family problems do arise, this stability helps kids understand that they can get through the difficult period, and that things are going to be okay. We all need a sense of security. Especially as your kids move into their teen years, actually talking to them about anything of note can become difficult. They clam up, and respond to any questions with a head nod or a mumbling “uh huh.” Eating around a table naturally encourages talking; it’s a low-stress environment for sharing and communicating with one another. It’s is a great opportunity to sneak meaningful discussions into your time with your preteen or teen, without them even noticing. And if you are used to eating together as family they will be used to talking with you and you can notice changes in their behavior. The daily small talk also helps create more well mannered, socially adept children. Talking with each other and engaging in learning more about each other’s day can lead to more happiness in your family life. With nearly 1/2 of the U.S. population overweight or obese, many people want to do all they can to stay healthy. Eating meals around a table is a simple step you can take for you and your family to ensure that everyone eats better. Why? The more conscious you are of eating, the likelier you are to only eat the amount of food you actually need. Unlike eating in front of the TV, you won’t be shoveling food into your mouth without even noticing it. And, meals served around a table are likelier themselves to be healthier. 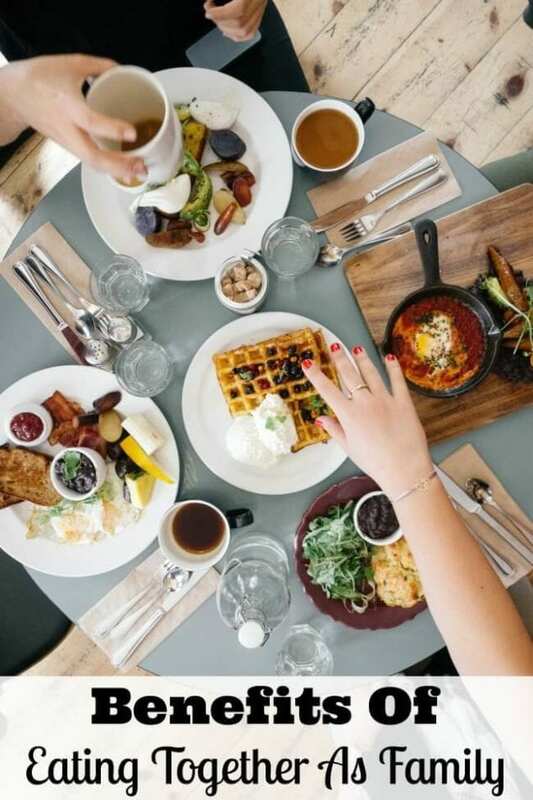 Eating together as family also helps to model good eating habits and emphasize healthy eating intentions which may be beneficial in bringing about dietary change. What? Does eating together as family really effect grades? Yes, it does. According to a 2009 study done at Columbia University by CASA, “Compared to teens who have five to seven family dinners per week, those who have fewer than three family dinners per week are one and a half times likelier to report getting mostly C’s or lower grades in school.” Now if still overwhelmed by the knowledge that just eating together as a family can lead to better grades, consider this. “Teens who report typically receiving grades of C’s or below in school are likelier to smoke, drink and use drugs compared to teens who typically receive all A’s or A’s and B’s in school. There you have a least five great reasons for eating together as family. Family dinner table time matters. How many times a week do you have a family dinner? Do you think you will enjoy a family dinner together tonight?